As you may know the Santa Ana City Council has been searching for a new City Manager – ever since they had to dump their previous City Manager, the overpaid David Cavazos. 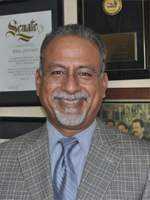 The City Council majority, comprised of Council Members Michele Martinez, Sal Tinajero, Vince Sarmiento and David Benavides, has now offered the job of permanent city manager to Raul Godinez, a former Santa Ana public works director who now manages public works for the much smaller city of Lynwood, according to the Voice of OC. The Voice of OC also reported that Councilman Jose Solorio went along with the choice of Godinez. However it is probably the case that he saw the writing on the wall as the Council majority appears to be fixated on hiring Godinez. You might recall Godinez. He worked briefly as Santa Ana’s Public Works Manager a couple years ago but then he got lucky and was handed the job of City Manager in El Monte. However Godinez was apparently well over his head in El Monte and he turned out to be at real train wreck. More than a week after officials announced that Eric McBride would be the city’s next police chief, the top cop-to-be abruptly withdrew his candidacy amid sharp criticism of his stance on undocumented immigrants. McBride, who is currently San Bernardino Police Department Assistant Police Chief, was to be sworn in as El Monte police chief Feb. 25. McBride’s decision came after immigrants rights activists over the weekend began to rally opposition against him because of anti-illegal immigration policies he pushed while he served on the Hemet City Council from 2006-2010. “This selection is a slap in the face of the community and it is dangerous given his radical views on so-called illegal immigration,” El Monte resident and activist Veronica Tomas-Castro said. “This is a community of immigrants and we are just shocked that we would have Joe Arpaio as a police chief,” she continued, referencing the controversial sheriff of Maricopa County, Arizona. In 2010, McBride, then Hemet mayor, introduced a resolution in support of Arizona’s controversial anti-illegal immigration law. That law, SB 1070, requires police officers to check the immigration status of everyone they stop if they suspect the person might be an undocumented immigrant. The police chief candidate Godinez chose had also proposed requiring day laborers to have business licenses, to make it easier to find and deport undocumented immigrants, according to the Voice of OC. A few months after Godinez picked McBride to the Chief of Police, he suddenly resigned, according to the San Gabriel Valley Tribune. Godinez was later hired to be the Public Works Director at the City of Lynwood, where he remains today. He is managing about 60 people in that department – but somehow the Santa Ana City Council majority thinks he can manage Santa Ana’s over 1,400 city employees – even though he was a total flaming disaster in El Monte. Why in the world would the Santa Ana City Council majority want to hire a guy who thought it was a great idea to hire an immigrant basher as Chief of Police in El Monte? Well the obvious answer is that once again our City Council majority is hung up on hiring a Latino instead of going out there and hiring the best City Manager irrespective of their race. I am also told that they are insistent on hiring a man – even though some of the best candidates for City Manager happen to be women. Even worse most of our City Council majority are on their last terms! A year from now Martinez, Benavides and Tinajero will be gone from the City Council – and Sarmiento will be gone in two years. Why now just continue with an interim City Manager and let a new City Council pick our new City Manager in a year? There are of course a few good candidates out there such as Anaheim Assistant City Manager Kristine Ridge, and Santa Ana Parks and Rec Director Gerardo Mouet. Either one of them would be a far better choice than Godinez! Ridge is the No. 2 official in Anaheim, which has a slightly larger population than Santa Ana and was recently assigned as the city’s point person on addressing homelessness, an issue Santa Ana struggles with as well, according to the Voice of OC. The bad news is that the City Council majority seems hell-bent on hiring Godinez – and they might do this as soon as next Tuesday. You can email the City Council here. Check out the articles we linked to. In one of them there was a complaint that Godinez did not know what he was doing and he often relied on the Deputy City Manager, who did know what he was doing. That Deputy took over when Godinez resigned. Godinez is nothing more than a public works manager. He is an engineer by trade. We need a city manager not a public works manager! You failed to mention Solorio voted for Raul. This idea that the City only wanted a Latino is foolish and intentionally meant to degrade Raul. It’s directly from the Pulido playbook. And, please reach out to electeds & staff in Anaheim to discuss Kris Ridge. She was viewed as incompetent, ineffective and hostile to Latinos. We don’t always agree with Solorio and he is wrong this time. As for Ridge can anything she did be as bad as Godinez hiring a racist Chief of Police? Sure, firing a well-regarded Latina City Attorney. I can hardly understand the mumbling and inarticulate Juan Villegas so have no reason for his vote. I understand Miguel’s vote. He wants less qualified folks that obey him like Gerardo. Hiring a racist Chief is a whole lot worse than firing a city attorney. Give me a break! I have never found Villegas to be inarticulate or to mumble. Clearly you have some axe to grind with him. Perhaps you preferred his predecessor – Roman Reyna, who never did explain why he was caught taking a picture with members of La Eme? What Miguel wants is a good City Manager. That certainly was not Cavazos and it won’t be Godinez either. Terminating the employment of a female city attorney because she is Latina, is much worse. I have no axe to grind with Villegas. His mumblings are far better than Reyna’s incoherent thoughts (not to mention his ethically challenged buddy and serial cheater, David Benavidez). The fact that Miguel would be fine with Gerardo says everything about him wanting someone he can control as opposed to qualified. Honestly though how can Miguel control anything when he only has two other votes on the Council?